Messenger RNAs (or mRNAs) carry the information required to make proteins in cells. The end of an mRNA is generated by a multi-protein complex called cleavage and polyadenylation factor (or CPF). CPF cuts the mRNA at a specific site and then adds a string of adenosines – a modification that is important for translation of mRNA into protein and for mRNA stability. 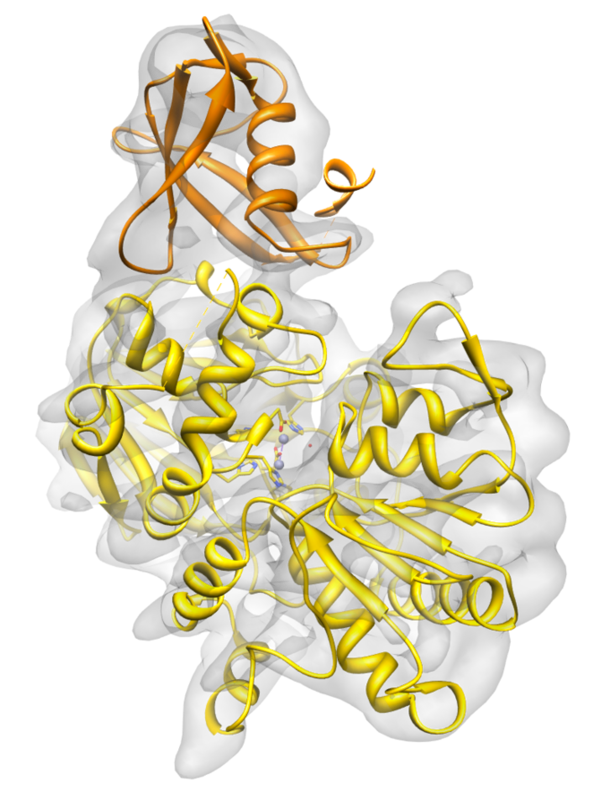 A team in Lori Passmore’s group at MRC Laboratory of Molecular Biology in Cambridge have now reconstituted the activities of CPF using recombinant proteins. Their work is published in Molecular Cell and includes a cryo-EM reconstruction of the nuclease that cuts mRNAs, bound to its partner Mpe1. This was particularly challenging because the only part of the proteins that aligned well was 57 kDa in size – relatively small for cryo-EM. These data were collected on a Titan Krios with Volta phase plate at IGBMC Strasbourg through Instruct proposal PID2859. Read more in the published results.